The Notre Dame Initiative for Global Development (NDIGD) combines the existing world-class teaching and research faculty of the University of Notre Dame with a dedicated staff of experienced international development professionals, administrators, and researchers. Together we address the challenges of building just and equitable societies by leveraging the University’s signature strengths to promote development and human dignity worldwide. 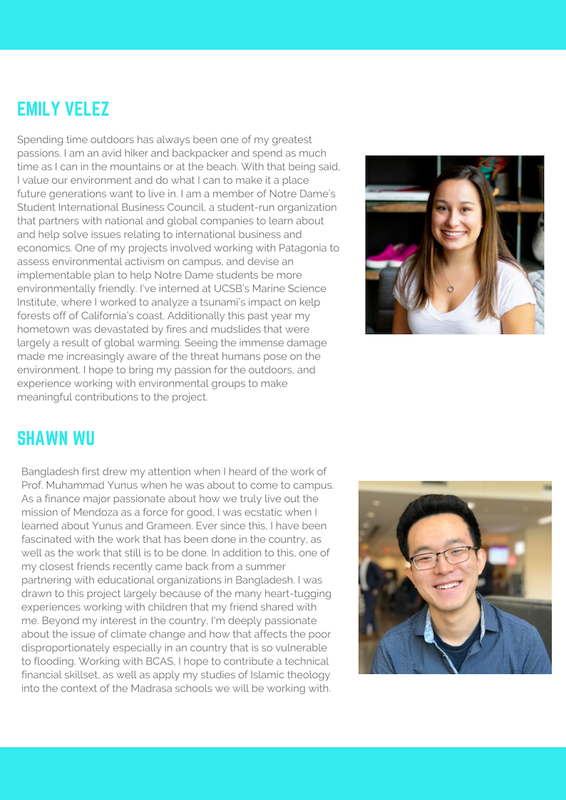 "The Notre Dame Initiative for Global Development (NDIGD) is forming a team of 8 undergraduates to support research to improve clean water access in Arcabuco, Colombia. The student team will travel to Arcabuco twice during the 2018-2019 calendar year (Fall Break and Winter Break). 2019 academic year for field research. Students will gain valuable, real-world experience by working with the Notre Dame Initiative for Global Development (NDIGD) on an innovative, applied research project to improve local water, sanitation, and hygiene (WASH) systems in Arcabuco, Colombia. Climate change is a global issue that does not recognize borders. There is perhaps no place where this is more apparent than Bangladesh, which is exposed to a myriad of hazards: flooding, cyclones, temperature and rainfall variations, drought, water logging, and salinity intrusion in water and soil. Bangladesh is often considered the country most vulnerable to climate change in the world. The Keough School Integration Lab is partnering with the Bangladesh Centre of Advanced Studies (BCAS) to help advance its important policy work focused on climate-vulnerable populations. This i-Lab BCAS Project specifically assesses the climate vulnerability of different sub-populations, especially women and children, across the ecosystems of Bangladesh in order to evaluate current national policies and develop climate vulnerability maps that can further inform future policy making. Critically important is increasing public awareness about climate change, particularly among the poor and those who are most vulnerable to the impact of climate change. Given the need for greater awareness and education, the team has begun to think about the possibility of developing a curriculum for climate change and disaster risk reduction, especially looking at the role that Madras schools, that provide education to the majority of the poor population, might play. Working with BCAS, the development of a accessible and informative curriculum that could be used by Madras schools in Bangladesh that addresses issues of climate change and disaster risk reduction in operational ways. The Tecnológico de Monterrey and its network of campuses throughout Mexico is committed to providing quality education, world-class research, and building innovative models for the benefit of society. With the leadership of ITESM’s School of Medicine and the School of Government, the University is looking to build a new interdisciplinary center for global health training and research with strong links to practice. The DGHSM aims to be a global center of excellence that generates health through training, research, innovation and knowledge translation, addressing in a profound and interdisciplinary way the existing inequities in Mexico and the world, based on health as a human right. The DGHSM aspires to lead in training, research, implementation and public policy development in Global Health and Social Medicine in Latin America, through the creation of integral solutions to address social factors and strengthen health systems with a preferential option for vulnerable populations. ITESM’s DGHSM is currently exploring the possibility of partnerships with the Program on Global Surgery and Social Change (PGSSC) and the Partner In Health’s sister organization, Compañeros en Salud in Chiapas, Mexico. The Program on Global Surgery and Social Change (PGSSC) is a collaborative effort between the Harvard teaching hospitals, Harvard Medical School/ Department of Global Health and Social Medicine, Boston Children’s Hospital (BCH) and Partners In Health (PIH). This organization emerges out of work of the Lancet Commission on Global Surgery, tled by Dr. John Meara at Harvard Medical School (a 1986 ND graduate). PGSSC’s objective is to advocate for Universal access to safe, affordable surgical and anesthesia care when needed. Compañeros en Salud is affiliated with Partners In Health and works in rural Chiapas Mexico to provide quality health care to underserved communities and hopes to serve as an inspiring model to train and accompany health professionals and community health workers, and to deliver quality health care in low resource settings in Mexico and elsewhere. Both PGSSC and PIH have deep ties to Notre Dame, and have served as clients on DAT projects over multiple semesters. The ITESM Department of Global Health & Social Medicine is looking for models of university-based, interdisciplinary centers that work in the international context in close partnership with health service providers and policy makers. ● ITESM is interesting in exploring different models of partnership that have been established for developing, first-rate, interdisciplinary global health centers that have strong links to practice, that highlight different institutional structures, incentives, and potential partnerships. ● ITESM hopes to explore and expand partnerships with international development and health organizations, such as Compañeros en Salud, the Harvard Medical School and the University of Notre Dame, consistent with its strategic objectives. ● ITESM is interested in implementing a framework to develop international partnerships. 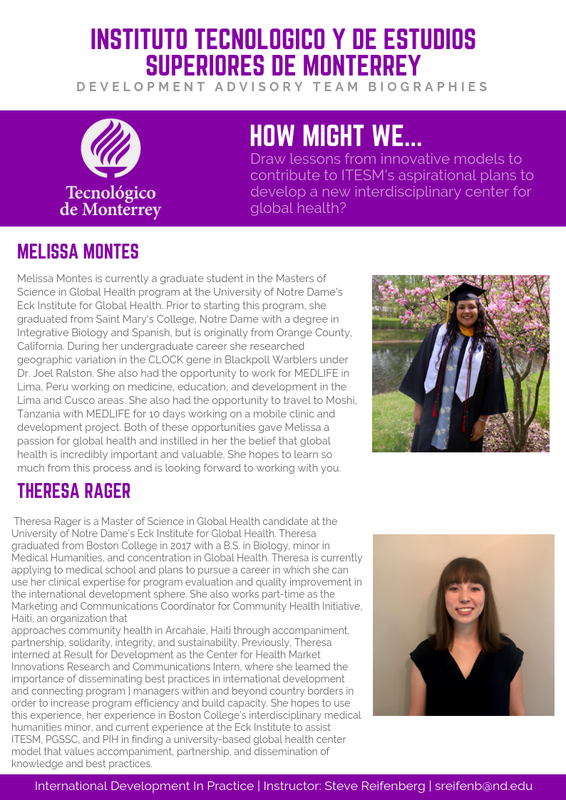 That ITESM uses the systematic examination of different examples and models for building an interdisciplinary, university based Center for Global Health with a strong link to practice in ways that it might serve as a roadmap for a path forward. Latin American Leadership Academy (LALA) seeks to promote sustainable economic development and strengthen democratic governance in Latin America by developing a new generation of leaders. 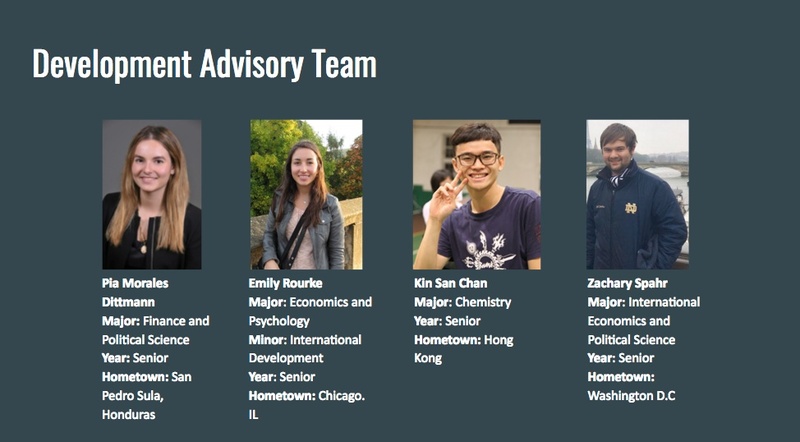 LALA creates international and socioeconomically diverse cohorts of the most promising graduating high school students who have demonstrated an unshakeable commitment to social change. LALA is launching leadership boot camps throughout Latin America to create local hubs of social impact and find values-aligned youth. In the near future, LALA hopes to open an eighteen-month program, which blends entrepreneurial leadership, a liberal arts education, and social and emotional learning. The program connects participants to mentors, resources, and opportunities, and LALA envisions a diverse continental ecosystem that collaborates across differences to bring shared prosperity to Latin America. As the LALA ecosystem expands, attracting new members to the community (youth participants, social entrepreneurs, facilitators, advisors, etc. ), we need creative ways to stay connected, both in local hubs and at a distance, essentially building and sustaining effective networks. More than just “keeping track” of what people are doing, we aim to create a community of mutual support and guidance (i.e. accompaniment). So far, after our one-week boot camps, alumni have used Whatsapp groups to keep in touch about projects they are developing, to celebrate accomplishments, and share resources about college applications, educational opportunities, local politics, etc. However, Whatsapp is visually messy, has a limited audience, and can restrict engagement to a superficial level. Latin American Leadership Academy wants to enhance its understanding possibilities for strong networks to combat social inequality in the region. We want to develop a network of partnerships with people and institutions that have the strongest commitments to supporting education and social change. LALA would like to know: what are other organizations doing successfully to “keep their communities connected”? Some ideas that were brainstormed: “Humans of LALA” posts, a podcast, a LALA interface with notifications, among others. From this exploration of best practices, we would like to launch strategies to nurture, thicken, and enhance the connections in our Latin American ecosystem. Broadly speaking, this team hopes to map successful examples networks building in support social impact initiatives that might serve as models to help improve LALA’s decision-making and better inform our network building aspirations. Malnutrition is a significant challenge facing children worldwide, and it has been increasing in the past decades: today, one third of the world’s population (2.1 billion) is either undernourished or overweight/obese. While best practices for addressing nutritional challenges among children and adolescents abound, the rising rates of malnourished children internationally indicate that treatment efforts are still lacking. Addressing the challenge of malnutrition is not merely a matter of enabling access to resources, but it is about understanding the root causes that are inextricably linked to behaviors influenced by family, community, lifestyle, and complex environments. It depends on understanding the relationship of malnutrition to other areas of health and to social and educational interventions. In 2017, Gisela Solymos, co-founder and former CEO of CREN, Center for Nutritional Recovery and Education, Nitesh Chawla and his team from the Interdisciplinary Center for Network Science & Applications, and Walter Link and his team from the Global Academy Foundation have integrated efforts to develop the concept of a Knowledge Hub (KH) that provides a framework for capturing data, knowledge, and experiences to help drive positive outcomes in child health and malnutrition. share its knowledge with governments, NGOs, global leaders, and other key players in the field. What are the best practices of organizations focused on innovative work with child malnutrition in developing countries? What are the innovations and how have they been deployed? What interventions and strategies do they use to share these ideas and make them operational? Do they use technology such as electronic medical records, mobile apps, etc.? How do they use it? 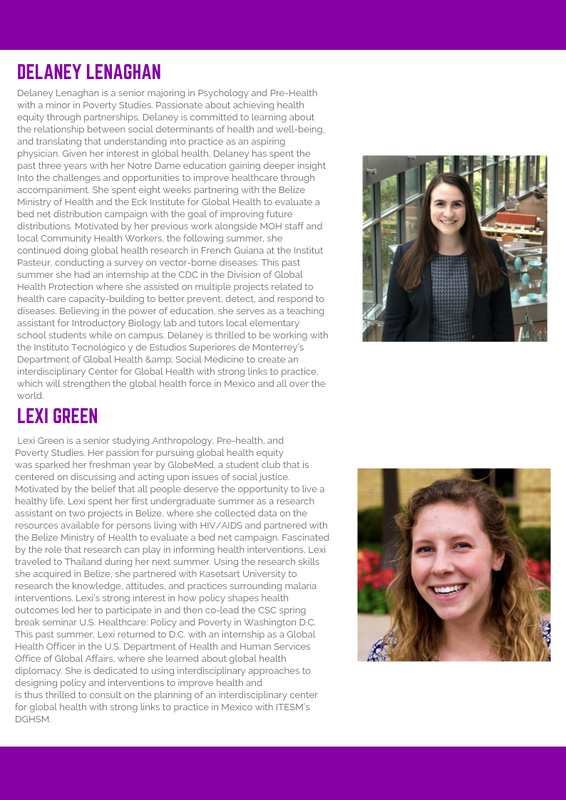 The generation of a professional presentation of the best organizational practices related to addressing malnutrition, and in turn, supporting and exploring the Knowledge Hub’s unique potential contributions to the field. Education Bridge seeks to create flourishing South Sudanese communities through education and peace building. As part of this mission, Education Bridge opened its first school, Greenbelt Academy, in Bor, South Sudan in February 2017. Led by South Sudanese Notre Dame graduate Majak Anyieth ’17, the Greenbelt Academy currently serves over 200 students in grades 9-10, with plans to double the school population and have grades 9-12 over the next two years. The Greenbelt Academy seeks to provide quality secondary education as well as to develop a generation of South Sudanese who are not only well prepared academically, but who also see themselves as peacemakers and transformational leaders. Education Bridge has worked with Notre Dame DAT teams over multiple semesters on projects related to developing a peace building curriculum, building enhanced opportunities for girls, and contributing to organizational sustainability. Education Bridge now wants to explore the possibility of building networks internationally in service of its students and teachers that expand opportunities, as well as formalize relationships that support the development of the overall organizational culture of Education Bridge. Education Bridge looks forward to working with a team of Notre Dame students to research how other non-profit organizations, especially those running educational and/or child development programs in the international context, have effectively build international networks in service of their mission. How do the best non-profit educational organizations think about building high functioning networks in service of their mission? How can we connect our students with a wider set of global possibilities, whether through technology or by travel, that will help expand their understanding of the world and their possibility to make transformational change? We believe we can draw lessons from the African Leadership Academy and other institutions, and want to explore student exchange, model UN, leadership development and the like. In support of teachers and administrators, how can we find relevant development opportunities for them? We could also imagine a “Greenbelt Fellowship” that might draw talented educators and professionals to work with the Greenbelt Academy to help develop and train current teachers, develop new curricular and extracurricular activities, and more generally expose the school to more innovative pedagogy and technology. The development of a number of good models of building networks and sustainable partnerships will be relevant for Education Bridge students and teachers, as well as concrete proposals that Education Bridge can utilize and implement as part of its strategic planning process to become a more dynamic and sustainable organization. The University of Notre Dame enjoys extraordinary worldwide presence, a good portion of which is mediated through its unique network of Global Gateways: centers and other institutional arrangements around the globe. The current five Global Gateways—located in Beijing, Dublin, Jerusalem, London, and Rome—provide academic and intellectual hubs where scholars, students, and leaders from universities, government, business, and community gather to discuss, discover, and debate issues of topical and enduring relevance. Each Global Gateway has dedicated staff who collaborate with their counterparts at Notre Dame’s campus to support Notre Dame programs and outreach. Notre Dame International coordinates the management of the Global Gateways and supports faculty in developing and sustaining programs at them. The University is considering establishing expanding its presence in India, where it currently has a “Global Center.” Established in January 2016, the Mumbai (India) Global Center is part of the University of Notre Dame’s Asia Initiatives. The Center is building the University’s visibility and engagement with India’s top educational institutions, and works with different campus units and organizations to implement activities and projects across India. We will begin by conducting a number of interviews with key stakeholders who will be important to interview to better understand the landscape and possibilities. These interviews include faculty of Notre Dame both on campus, in India, and in South Asia. Through this class project, we propose to map the range of faculty, staff, student and alumni engagements and relationships in India, and then explore possibilities for a more robust set of partnerships and engagements with India. ND’s presence in India has a unique opportunity to look beyond ND's traditional Gateway functions and to explore how we might be more intentional with our collaborations with local government agencies, industry partners, development organizations, and educational institutions. As we explore the opportunities related to India, we will make a special effort to explore possibilities for opportunities related to international development and to design thinking. Girl Child Concerns (GCC) is a Nigerian Non-Governmental Organization, established in 2000, dedicated to improving the lives of youth, particularly of girls, through improved education opportunities while ensuring availability of board-based education for all young people. Through a comprehensive approach, GCC provides scholarship opportunities that not only offer formal education but also help equip girls with life skills. In addition to attending school, every GCC scholarship student attends an annual skills development retreat for four days to foster inspiration and motivation within the girls, as well as develop personal relationships. These life skills workshops encourage the girls to build an agenda on what they want to learn (for example, the strategies for passing exams, or addressing concerns about early marriage, teenage pregnancy, and more). Scholarship recipients also commit to give back by committing to help at least five other children, as well as to participate in a legislative education campaign that involves getting girls to share their experience and speak directly to lawmakers. Girls’ education is disfavored in many communities in Nigeria due to cultural perceptions, and compared to boys, girls have an extremely high dropout rate. Without education, girls often end up in poverty, dependency, and early marriage. In addition, the community is robbed of the skills and talents these girls would have contributed. There are many reasons for these numbers, including cultures that undermine the importance of girls’ education; conflict in the country, in particular in areas long held by Boko Haram that have forbidden girls from attending school; perceptions of gender roles among girls and in the general community; poverty; and forced child marriage. We will first review challenges to girls’ education in Africa, and then put this research in the context of Nigeria (through an earlier DAT project, there is excellent background information on promoting girls’ education in South Sudan, and the team will access to the individuals leading this initiative). We will then host various interviews with our partners at the GCC, staff at the Keough School, and various experts of the Nigerian school community. In the end, GCC would like contextualized recommendations on how GCC can attract, maintain and successfully engage girls’ students in school and build opportunities for their futures in line with best practices globally, learning from the interviews and dialogue with those who know the context as well. Global Surgical Systems Strengthening through Research, Advocacy, and Implementation Science, using the Frameworks developed as part of the Lancet Commission on Global Surgery. Developing Leaders in Global Surgical and Health Systems through Research, Advocacy, and Care Delivery. PGSSC research focuses on surgical and health systems strengthening that is measurable, transparent, and locally-driven. PGSSC has been opportunistic about the issues and countries where they have engaged, trying to take best use of the capacity they have to promote their strategic objectives. The PGSSC is interested, in its planning for the future, to explore and expand partnerships with international development and health organizations, such as Partners In Health and the World Health Organization, as well as universities, such as the Harvard Medical School and the University of Notre Dame, consistent with its strategic objectives. The development of a set of future scenarios or pathways that PGSSC might explore for potential partnerships, as well as the strategic use of their experience, expertise, and capacity to maximize their organization’s impact in the future. These offices represent the bishops' interests in policy formulation and communication, advocacy, education, refugee resettlement, and other specialized services to at risk and vulnerable populations, such as victims of trafficking and unaccompanied minors. The Committee actively promotes migration-related interests with public policy-makers at the national and international levels. Committee members and staff periodically testify before Congress and meet with Administration officials to advocate the bishops' positions. Among the high priority policy concerns of the Committee is refugee protection and finding durable solutions to their plight. In this context the Committee occasionally arranges site visits to refugee areas of the world to witness the conditions of the refugees and to call for adequate responses on the part of the international community. The summer of 2014 witnessed a significant uptick in the number of unaccompanied migrant children and families who originated in the Northern Triangle countries of Central America. While an average of 6,800 unaccompanied children were apprehended in each year from 2004 – 2011, the number jumped to roughly 13,000 children in Fiscal Year 2012 and rose to just over 38,000 in 2013. 68,541 unaccompanied children were detained in FY 2014 and, although a decrease was evident the following year (39,970), the numbers again increased in FY2016 (59,692). Family units experienced a similar ebb and flow in total numbers during this same period. Although an array of Catholic, non-Catholic religious, and secular immigrant welcoming centers function throughout Mexico, the number of Catholic centers is the largest. The institutional Church alone coordinates seventy-five welcoming centers and, in addition, there are the number of centers run by religious orders and local Catholic institutions. Determining how many there are, where they are located, what services they provide, to whom they provide it, etc., is not entirely clear. Due to the size and complexity of the network, important advocacy and service-oriented efforts are constantly evolving; getting a better handle on where these centers are and efforts they are engaged in in support of migrants will provide much needed information to fill existing gaps in our knowledge. This effort will help to respond to the challenges of (1) ensuring enduring communication with what is an extremely mobile population; (2) the need for institutional mapping; and (3) scaling up capacity of the existing network. It would also be of interest to find out how the Mexican government is responding to these efforts, and whether policies are in place that would either support or inhibit their work. In 2013, Oxfam launched the Behind the Brands (BtB) campaign to challenge the ‘Big 10’ food and beverage companies on their social and environmental policies and practices, and to amplify the voices of key stakeholders such as farmers, workers, communities, consumers and investors calling on them to take action. The Big 10 companies include: ABF/Illovo, The Coca-Cola Company, Danone, General Mills, Kellogg, Mars, Inc., Mondelez, Nestle, PepsiCo, and Unilever. Over the last few years of the campaign companies have made significant new commitments to improve social and environmental standards in their supply chains. Oxfam is currently planning deepened engagement with companies to ensure that their business units and suppliers make progress in line with commitments, and to accelerate the transformation towards a more sustainable, equitable food system that empowers in particular smallholders and women (“BtB 1.1”). We additionally aim to encourage all supply chain stakeholders including the Behind the Brands companies to go further and to adopt new business models that ensure that more of the power and the value reach the farmers and workers within the chain, in particular women farmers and smallholders. The aim is to catalyze transformational change from the company all the way down to the farm in source countries. It includes four intertwined strategies: 1) Engagement with companies on implementation of commitments; 2) Extend commitments to associated traders in company supply chains; 3) Drive transformative change, hold companies accountable, and create new models for change in six target countries; and 4) Establish better food sector governance. The target countries include Brazil, Ghana, India, Indonesia, Malawi and Thailand. The proposal is for a team of students to conduct research and evaluation activities that support the BtB 1.1. Monitoring, Evaluation and Learning (MEL) framework. The MEL framework allows Oxfam to track the impacts of commitments down to the ground in priority countries. The overall objective is to reach and begin improving the lives and livelihoods of millions of small-scale producers, workers and communities by 2020, with specific milestones identified for the key themes (gender, climate, land, small-scale producers); by strategy (company engagement, trader engagement, country engagement and global agrifood systems). The aim not just to monitor Oxfam performance, but to contribute to the emerging field of how corporate contributions and supply chain engagement makes a difference on the ground and in particular in the lives of poor people, and in particular the rural poor (farmers) and women. The MEL framework is designed to demonstrate progress towards exploitation free, more equitable supply chains, in a way that documents both actions attributable to Oxfam and broader changes catalyzed by these actions that are instrumental in shifting key company, trader and supplier practices towards a future that is exploitation free and more equitable. The framework establishes rigorous indicators that demonstrate or document the number of people reached by Big Ten brand companies and traders, and better protected in theory by corporate-level commitments (e.g. all producers/workers in their supply chains); the number of people reached by implementation of these commitments in priority countries, including those better protected through national level private sector or governmental enabling policies, and those directly engaged by Oxfam country offices; and impact evaluations that demonstrate that the approach of implementation of supply chain commitments leads to positive benefits for producers, workers and communities in priority countries. We believe that the ability to measure progress, and demonstrate the social and environmental impact of company commitments will not just be of value to Oxfam, but for other organizations and institutions such as foundations, governments and aid agencies that have invested in market based approaches—and, to the global companies that have made significant commitments. The Notre Dame team will trace the sugar value chain in India and/or Brazil from top (focusing on BtB companies Coca Cola and Pepsi) to bottom (following company impact assessments to the local communities affected by corporate commitments.) All work will be carried out in coordination with Oxfam program and MEL staff. 1) Produce commodity profiles for each of the three commodities (sugar, palm oil, and cocoa) in India and Brazil. The profiles should examine social, economic, environmental and political risks for each commodity in India and Brazil. They should include data on: total number of producers, total number of women and women smallholders in the supply chain, associated emissions, and reported land conflicts. The profile should characterize commodity production at the national level, and highlight key issues for land, gender, climate and smallholders. 2) Assess the extent to which the policies of BtB companies and a selection of their traders differ at the global and national levels. This baseline diagnostic of company commitments involves desk research – to be conducted prior to commencing fieldwork – and the team will source publically available documents with assistance from Oxfam staff. This comprehensive diagnostic will inform company engagement efforts, in signaling where gaps exist between global commitments and action in-country and with traders. A goal of BtB 1.1 is to ensure national policies reflect best practice. Data and indicators: Estimate the number of producers and local communities in company supply chains, if possible disaggregated by small-scale producers and by gender. Our Behind the Brands teams in both countries are now in the final stages of planning multi-year interventions. We look forward to working with a team of master’s students in 2018, and to work this coming semester engaging with an undergraduate team on the background research and content of this proposal. We welcome ideas for how to ensure students have the most meaningful experience. Partners in Health (PIH) is an NGO that was founded on the principle of preferential option of the poor in healthcare. Headquartered in Boston, the organization originally developed as a single community health project in Haiti, and has since expanded throughout Haiti and into a dozen other countries including Peru, Russia, and Mexico. PIH works in partnership with governments and local communities in each of these countries. The main goals of the organization are to provide health care and education to those most in need, to work to alleviate the causes of disease, and to share the ideas and lessons learned . One of PIH’s central ideas is an approach to service through the model of accompaniment. The accompaniment approach to aid delivery is based on pragmatic solidarity with the poor. It proposes to build long-term relationships and mandates walking side by side rather than leading. This accompaniment model informs all of PIH's work; however, many within the organization are interested in a deeper and more meaningful understanding of the idea of accompaniment and its applications. · Identify the key principles of accompaniment that can be shared within the organization (globally there are some 15,000 people working with PIH) to promote awareness and understanding of accompaniment and its applications. Identify the most effective training, engagement, and other modalities to help build awareness and engagement around this idea within the organization. · Focus on opportunities related to the University of Notre Dame that highlight accompaniment in connection with liberation theology as seen in the book In the Company of the Poor: Conversations with Dr. Paul Farmer and Fr. Gustavo Gutiérrez. There are mutiple opportunities for drawing from the work of past Notre Dame student teams on this topic, as well as an anticipated volume on the concept of accompaniment led by Paul Farmer, with co-editors Jennie Block and Steve Reifenberg. Development and use of new, effective training materials and other ways of engaging the PIH community on the understanding and use of the concept of accompaniment in all their work. Education Bridge seeks to create flourishing South Sudanese communities through education and peace-building. As part of this mission, Education Bridge opened its first school, Greenbelt Academy, in Bor, South Sudan, in February 2017. Led by Notre Dame student Majak Anyieth, the Greenbelt Academy currently serves 240 students from Grades 9-10, with plans to double the school population and have grades 9-12 over the next two years. Greenbelt Academy seeks to provide quality secondary education as well as to develop a generation of South Sudanese peacemakers and transformational leaders. In order to maintain and develop its services, Education Bridge must develop a sustainable business plan that includes student tuition and fees, as well as raising funds each year to cover its the remainder of its operating and investment costs. However, because many of Greenbelt Academy students come from extremely low-income backgrounds, there is only a minimal tuition to remove financial barriers to education for students. Education Bridge needs to develop additional revenue streams, including fundraising is through private donations and institutional grants. Our challenge currently is that we have an ambitious set of goals, with limited funds and a relatively small support base for donations and grants. We would like to explore how to most efficiently increase our support base for donors and grants. We look forward to working with a team of Notre Dame students to research how other nonprofit organizations, especially those running educational and/or child development programs in the international context, understand and utilize different business and financial sustainability models. 1. How do the best non-profit organizations engage and retain donors in ways are satisfying for the donor, and time and cost efficient for the organization? 2. How do they most effectively tell their story and build partnerships with donors and organizations on an active basis that leads to regular donations/investments? 3. How can Education Bridge draw lessons from these successful organizations, and build a business model(s) to become more sustainable as an organization? Can Education Bridge collaborate with other partners in South Sudan, the U.S., or other countries? The development of a number of good models of sustainable organizations in the educational sector that will be relevant for Education Bridge, and proposals of concrete ideas that Education Bridge can utilize in the coming year as part of its strategic planning process to become a dynamic and sustainable organization. Enseña Chile is based on the successful Teach for America model, recognized for creating a critical mass of leaders committed to improving access to excellent education regardless of socio-economic circumstances. The organization works in Chile to provide quality education to 14- to 18-year-old high school students by bringing for two years outstanding university graduates with leadership skills into classrooms of under-resourced schools. Enseña Chile was founded by Tomás Recart in 2007 in Santiago, Chile. Throughout the past few years, Enseña Chile has noticed a rise in the applicant numbers of young professionals who have completed two or more years of work and want to refocus their careers. Despite not having a formal recruitment strategy to address this specific population, early evidence suggest that young professionals with a few years of professional experience are more successful teachers than those who join immediately after graduating from university. While Enseña Chile is primarily focused on recent graduates, this initial evidence has Enseña Chile interested in learning ways to promote, create an interest, attract and select young professionals with work experience. · Assess the current Enseña Chile recruitment strategy for people with professional experience. Analyze existing data regarding socio demographic characteristic of applicants to gather additional insights and understand better their overall profile. · Research best practices in organizations with similar missions (both inside and out the educational arena) to understand how to better increase Enseña Chile's young professional applicant base. One organization worth analyzing is Teach for America in the U.S.
Identify a strategy to promote, interest, and attract young professionals to Enseña Chile. If successful in the short-term, the organization believes teacher turnover will be reduced and student achievement will improve. Ideally, many of these young professionals will continue to meaningfully fight educational inequality throughout their careers either directly or indirectly as a result of their Enseña Chile experience. Currently operating in 30 countries, AVSI specializes in education, with deep experience in primary education in a wide array of global contexts, including complex and other emergencies. More broadly, AVSI boasts a record of demonstrated efficacy in both development and humanitarianism, including peacebuilding, water and sanitation, health, nutrition, and food security and livelihoods. Formulated over more than 40 years of development practice, the AVSI methodology is informed by Catholic Social Teachings as well as extensive organizational experience. AVSI established a permanent presence in South Sudan in 2005 after over a decade of implementing cross-border projects from northern Uganda. It first established a field office in Ikwoto County, Eastern Equatoria State (EES), before consolidating its presence in EES with a field office in the state capital, Torit, in 2009. An administrative office in Juba followed in 2011 and a third field office in Cueibet County, Lakes State opened in 2014. In each location, AVSI has followed in the footsteps of the Catholic Church, leasing Diocesan property and, in two field offices, taking over compounds and programming previously managed by the Comboni Missionaries. South Sudan has been a humanitarian emergency since civil war broke out between competing government factions in December 2013. In this moment, AVSI’s mission and portfolio in South Sudan remains heavily focused on long-term development activities. Given the emergency context, including the violence of July, 2016 and the ongoing aftermath, AVSI is seeking to continue improving its development work within a complex operating environment as well as address critical humanitarian needs in its geographic areas of implementation. Currently, AVSI maintains a geographic presence in an area of both chronic and acute food insecurity and high levels of refugee outflow as well as in an area with one of the highest rates of intercommunal violence, including cattle raids and revenge killings, in the country. AVSI seeks a DAT that is capable of providing intensive background research and critical analysis of primary and secondary data in support of project design, current and future field research, and ongoing project implementation. This may range from addressing more traditional challenges of international development within a humanitarian crisis to supporting active field assessments within a rapidly evolving humanitarian crisis. AVSI seeks a DAT with strong qualitative research skills as well as high degrees of flexibility and independence. Below are three tentative projects under consideration for the DAT. AVSI proposes that the DAT undertake two of the three listed following a discussion between client and DAT. How might community institutions related to EiE, such as a Parent-Teacher Associations or School Management Committees, contribute to community-based peacebuilding? The team should develop clear, thoughtful, well-organized and actionable research on the relevant themes that will impact AVSI’s practice.